Zor-El was one of Krypton's greatest scientist, even rivaling his brother Jor-El, who sat on Krypton's Science Council. Zor-El's greatest contribution to his world was his invention of weatherproof plastics, which were used to create a dome around Argo City. And so, when the entire planet of Krypton exploded, Argo City was saved and hurtled into space. Kept in orbit with its infrastructure tightly fused to Kryptonian soil, Argo City continued to exist. 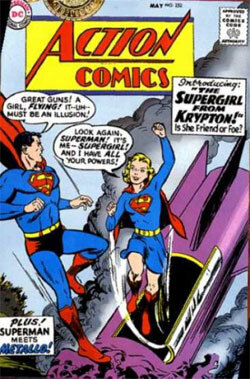 It was while Argo was in orbit, that Kara Zor-El was born. Unfortunately, the foundation of Argo City developed into Anti-Kryptonite, a substance deadly to Argo City's inhabitants. A meteor shower ruined the protective dome over the city, and destroyed the shielding the city had above its Anti-Kryptonite foundation. Tracking his nephew's presence to Earth, Zor-El rocketed his 15 year-old daughter to that same planet, in the hopes she would be watched over and influenced by Superman. With Zor-El and his wife Alura retreating to the Survival Zone, their daughter Kara made her way to Earth, and landed in Middle America, wearing an outfit similar to Superman's. After explaining her origin, Supergirl was accepted by Superman, and it is he who took her to Midvale, where she adopted her identity of Linda Lee Danvers, and was originally raised in an orphanage. For nearly one year, Supergirl operated as The Man of Steel's secret weapon against the forces of evil. And finally, after that period, Supergirl went public with her existence. Over time, she would become one of the world's greatest super-heroes, fighting evil with powers and abilities like those of her older cousin. Also, Supergirl would encounter fellow superdoers and join them in crimefighting. She became a member of the far future's Legion of Super-Heroes, and especially grew fond of Brainiac 5. She also developed a frienship with Wonder Woman, as the two females proved to be the mightiest super-heroines around. And although she never joined, Supergirl would repeatedly assist the legendary Justice League of America. As she matured, Supergirl/Linda Lee Danvers became a college student, while continuing to crusade against evildoers. She would carve her own legacy into the history of super-heroes, while joining her cousin Superman, and friends Jimmy Olsen and Lois Lane in the Superman Family of adventurers. Tragically, Kara's life ended as she battled the Anti-Monitor during the Crisis on Infinite Earths. Powers: Supergirl possessed all of the powers of Superman. Beyond Kryptonite, her only weakness was her lack of experience, compared to Superman, Batman, and other adult members of the Justice League of America.